My wife Debbie and I began this journey at Lagoon way back in 2001 when I served here as Music and Youth Director. This was our first full time ministry position. Up until that point we served in the Music, Youth and Children’s departments in various churches while I served in the USAF for ten years. After almost 5 years of wonderful ministry here at Lagoon, God moved us back to our home church, Cedar Grove Baptist, in Leeds Alabama. It was there that I was called into vocational ministry in 1996 and I served as Bi-Vocational Music Director. After moving back to Cedar Grove I served as Music Minister for a couple of years then God allowed us to jump back in to Youth Ministry as well. 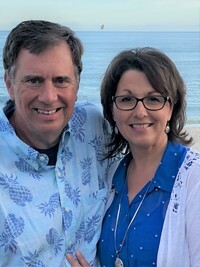 We served there from 2005 until 2013 when we took a short detour in Church Ministry to serve as House Parents at the Florida Baptist Children’s Home in Jacksonville Florida. God redirected us back into Church Ministry in 2014 as I served as Music and Children’s Pastor at FBC Screven Georgia. In the fall of 2017, God again began to move in our hearts for a different role. While riding with my pastor to visit a friend in the hospital, he asked me where I saw myself in 5 years. Well, I said that I see myself pastoring a small church somewhere. A few weeks later I received a call from Lagoon Baptist Church. I have always had a heart for the people here at Lagoon. After I left back in 2005 the first time, I always wondered if I would be blessed again to serve here as their pastor. We began this new journey as their pastor in February of 2018 and it feels like we have come back home. Things are different now. Our two children Scott and Brooke, who were in the youth group when I served here before, are now married and living in different parts of the country and we are blessed to see them from time to time. Many friends that we had back then have also moved on, some to different cities, some to different churches, and some have moved home to see Jesus. But Lagoon Baptist is still that welcoming church that it was when we were here before. Yes, we have come home to serve as their pastor. There are many new faces and our ministry has its challenges, but we are so blessed to be here and thankful that God has led us back to serve this community. So we invite you to come grow with us. If you are living in the Gulf Shores area and are looking for a church home, we would invite you to come and join us in investing in the Kingdom of God. If you are down here on vacation, the doors are open for you as well. You are welcomed in this place. Come join us, as we serve others in Jesus name.